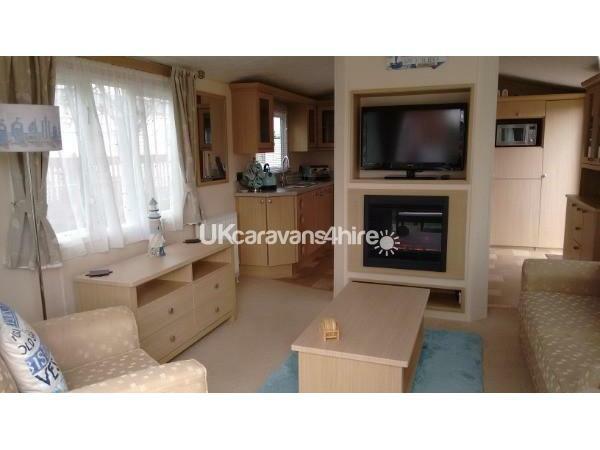 Our caravan has 2 bedrooms, full gas central heating and is double glazed. 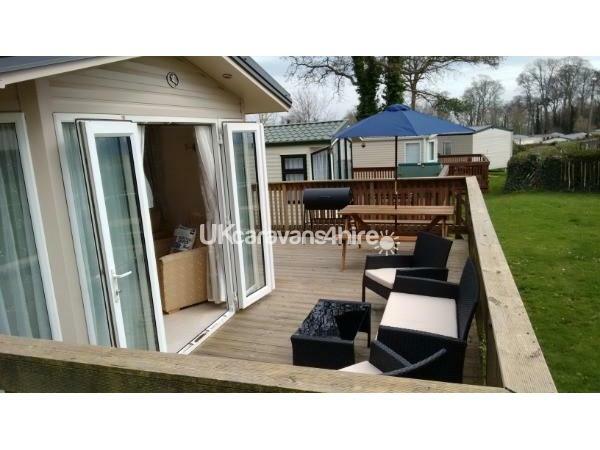 The lounge has double patio doors opening out onto the decking and offering views out onto the field and pool. Within the lounge there is a 3-piece suite, 32" flat screen TV, DVD player and selection of DVDs, a PlayStation with games and a remote control fire. 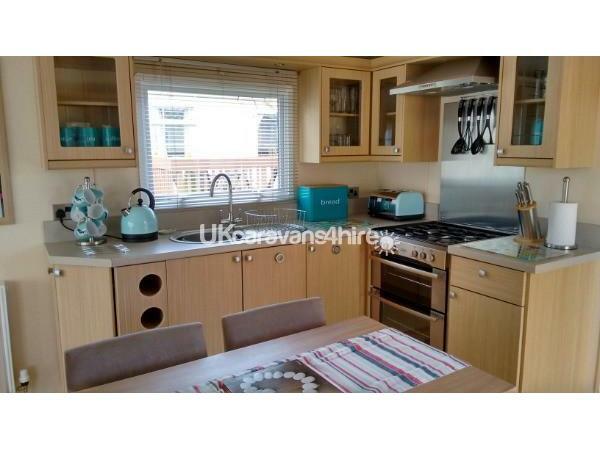 The well-equipped kitchen has a full size oven with overhead extractor fan, a microwave and integrated fridge freezer. There is also a dining table and seating for 4. The kitchen and dining room are separate from the lounge. 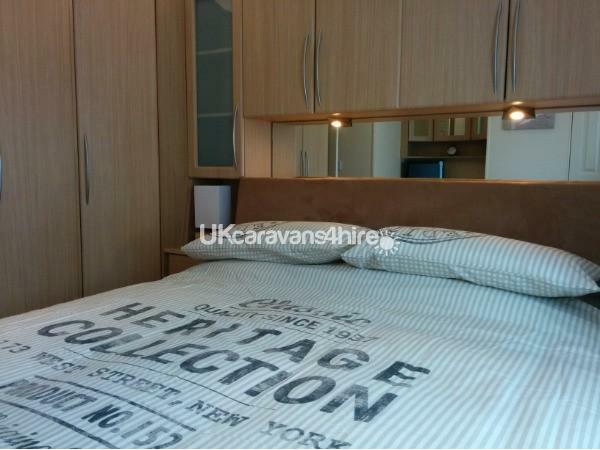 The double bedroom has a king size bed, en-suite WC, flat screen TV, plenty of wardrobe and cupboard space. 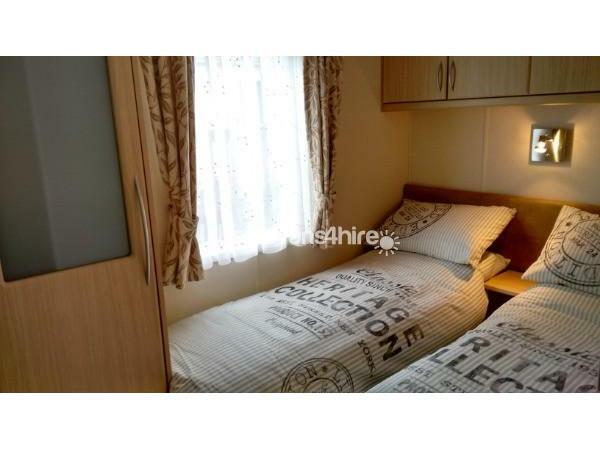 The twin bedroom has 2 single beds (this can be converted to a Double with prior agreement but you would need to supply your own Double Bedding), a single wardrobe and over bed storage. In the family bathroom you will find a large shower cubicle, WC and a wash basin. Outside there is a very large deck area with comfortable rattan furniture, Wooden Bistro Set a picnic bench . A car parking space is available alongside. We have tried to include everything you will need to make your family holiday comfortable and memorable. There is a selection of games, books and buckets & spades for the beach, all available for your use. 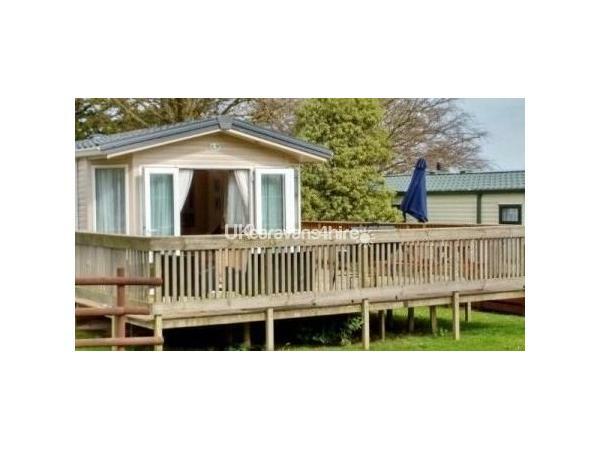 Our holiday home is positioned in a group of approximately 15 caravans in an area called 'The Glade', which is a quiet area of Oakcliff Holiday Park. We overlook a small field where the children can safely play and we are only 30 yards from the outdoor heated pool (seasonal). You would also have the use of all the facilities of Oakcliff's sister park Lady's Mile, which is all included in the price. We require a non-refundable £100 deposit to secure your dates. Oakcliff Holiday Park is an 8 acre park laid out in lawns and parkland around an elegant Georgian house. 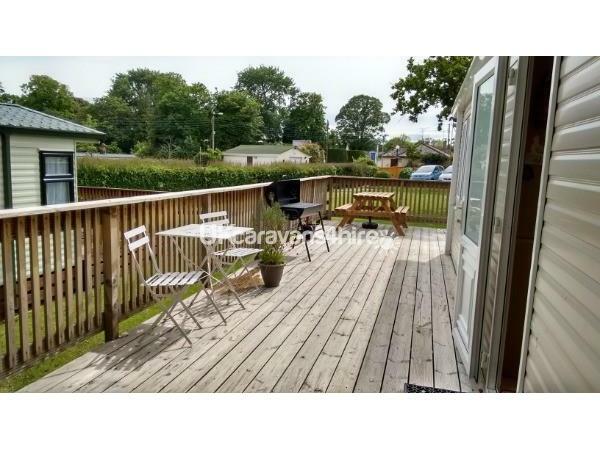 It has a prime location in Devon's premier holiday resort of Dawlish Warren, just 600 yards from the beautiful Blue Flag beach, sand dunes and 500 acre nature reserve. The outdoor heated pool is open from Whitsun to September and features a decked area for enjoying the sunshine and a paddling pool for the kids. There is a children's play park on Warren Point site, which is open all year round and provides a fantastic area for the kids to enjoy themselves - complete with a climbing frame, slides and swings. 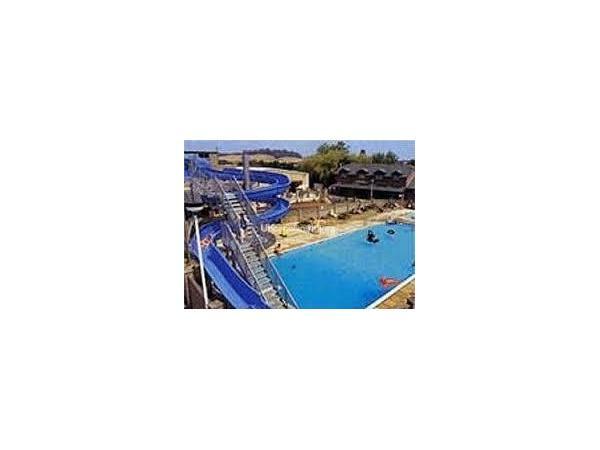 You will also have full use of the clubhouse, with entertainment and restaurant, a heated indoor and outdoor swimming pool with unique flumes and separate plunge pools, an adventure playground with slides and indoor themed play area, Highway 66 bowling alley, an amusement arcade, a takeaway and a gym & sauna (additional charges apply) - all at the sister park Lady's Mile. Within 2 minutes walk of our caravan is The Mount Pleasant Inn pub restaurant and a 5 minute walk away there are four more pubs serving food. You will also find Grand Prix Go-Karts, Pirate's Cove Adventure Golf, amusements and rides. You can have 18 holes of golfing fun at Dawlish Warren Golf Club, which is a fantastic place to play golf, with fantastic views. Sea and coarse fishing are available locally. A Sainsbury's supermarket is nearby. Dawlish is a short walk along the sea wall (about 20 minutes) if the tide is low or you can jump on the No.2 bus or take the train. 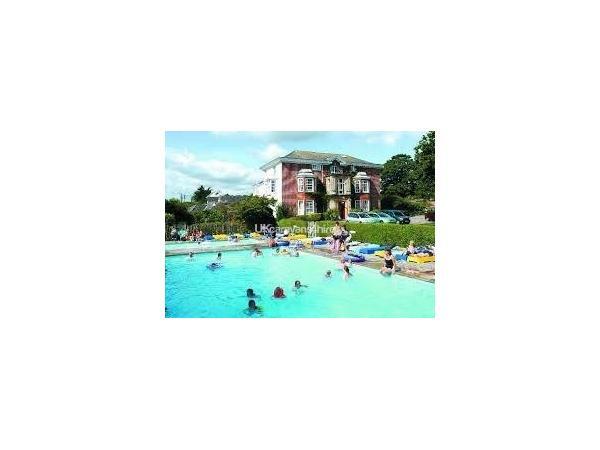 Further afield, other places of interest include Paignton Zoo, Paignton beach, pier and harbour, plus shops, amusement arcades, pubs and restaurants and a 9 screen multiplex cinema. Take a nostalgic trip on the Dart Valley Steam Railway from Paignton to Kingswear. The historic fishing port of Brixham, as seen on TV's 'Fish Town' is close by, where you can spend the day crabbing in the harbour, wandering around the fish market, going aboard The Golden Hind (replica) or eating at one of the many seafood restaurants; The Breakwater is a favoured spot for sea fishing and sightseeing and fishing boat trips can be taken throughout most of the year. Torquay has many of the high street chain stores. Then there's Kents Cavern; prehistoric caves, home of the ancient human, tours, shop and café. Also Living Coast Zoo where you can see penguins, otters, puffins and seals. Or why not visit Babbacombe Model Village.